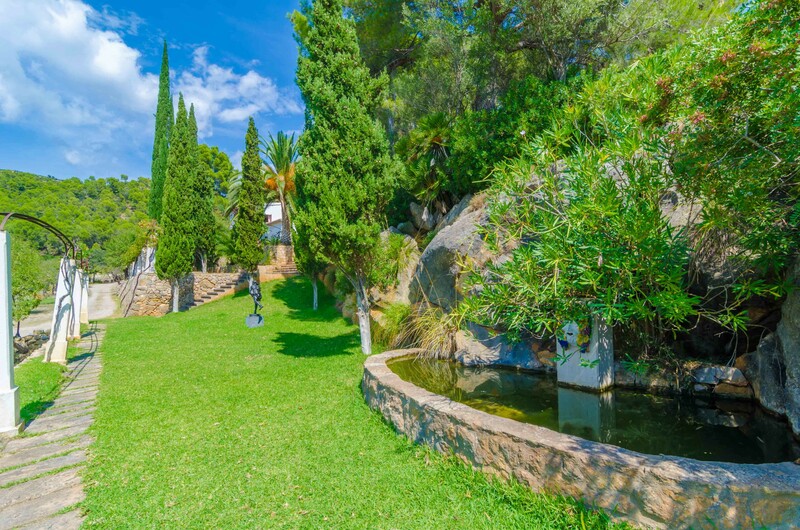 Within an amazing natural environment, you can take a refreshing dip in the beautiful chlorine pool that sizes 12 x 6 metres and with a depth between 1.50 and 1.80 metres. 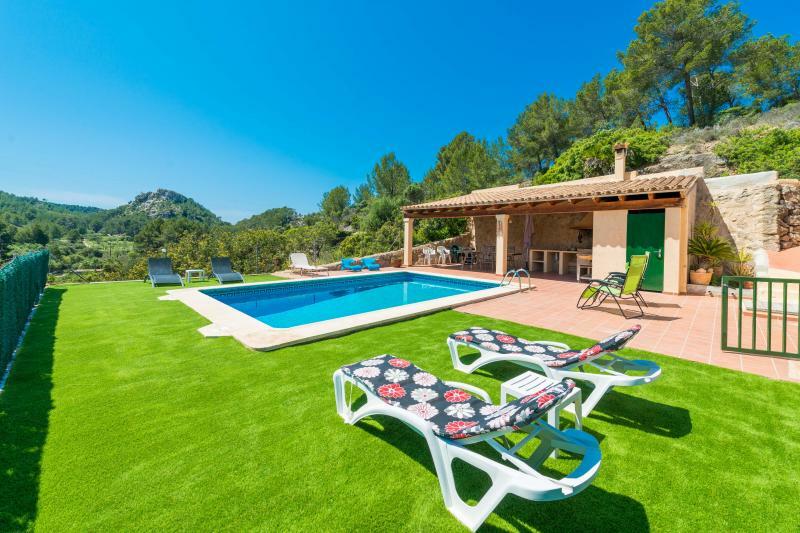 You can sunbathe on a sunbed at the fantastic terrace around the pool while admiring the wonderful views of fields and forests. 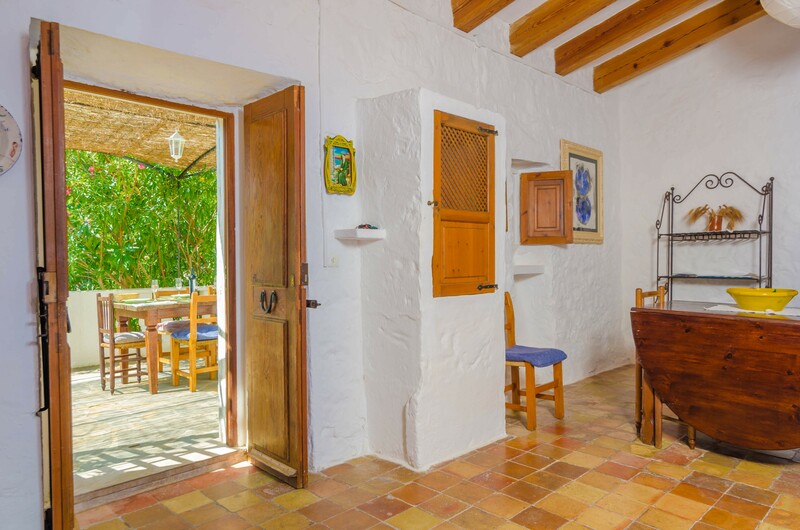 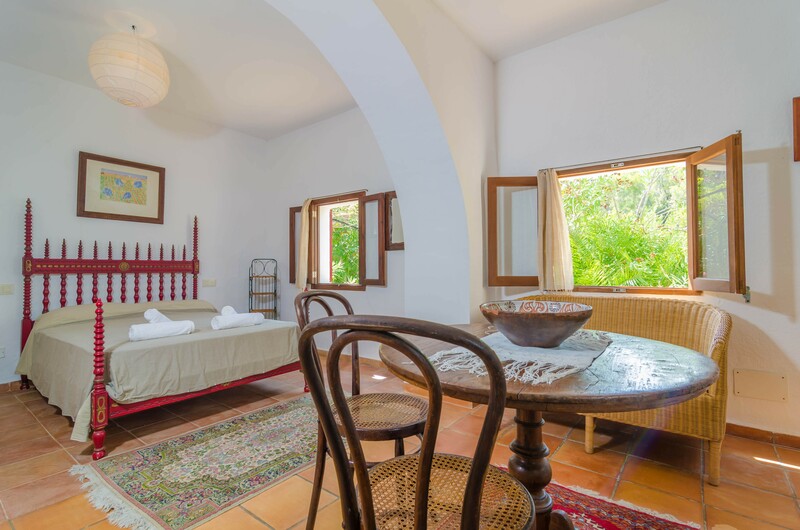 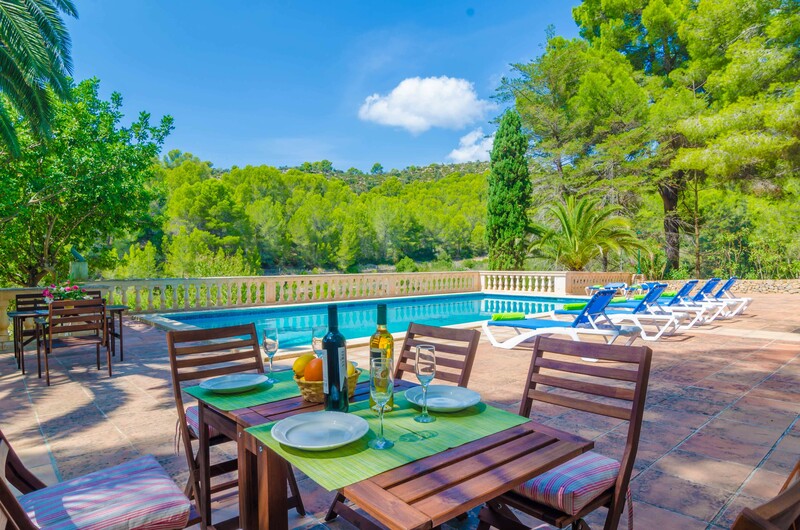 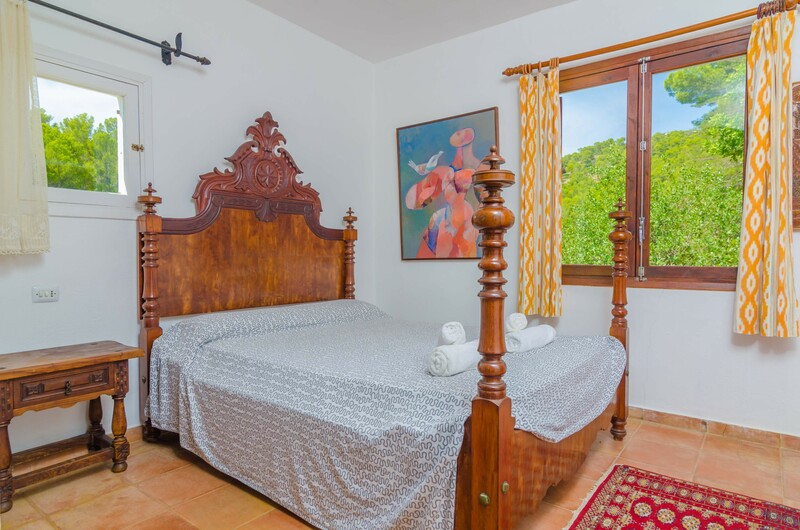 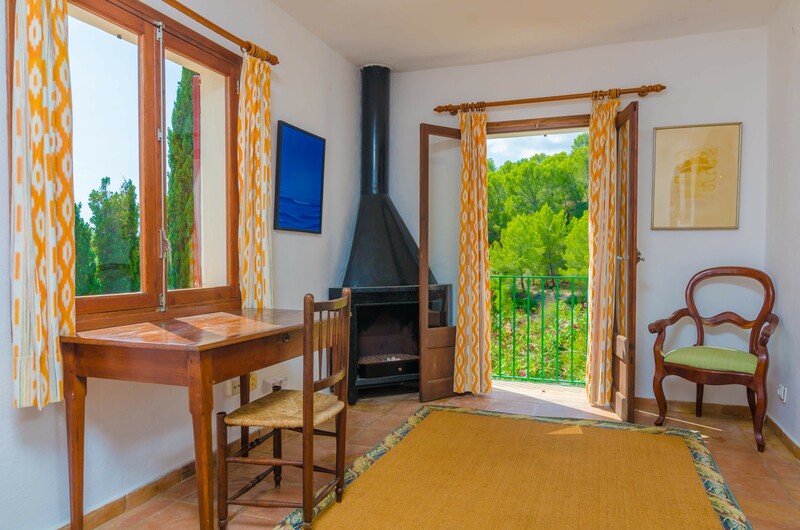 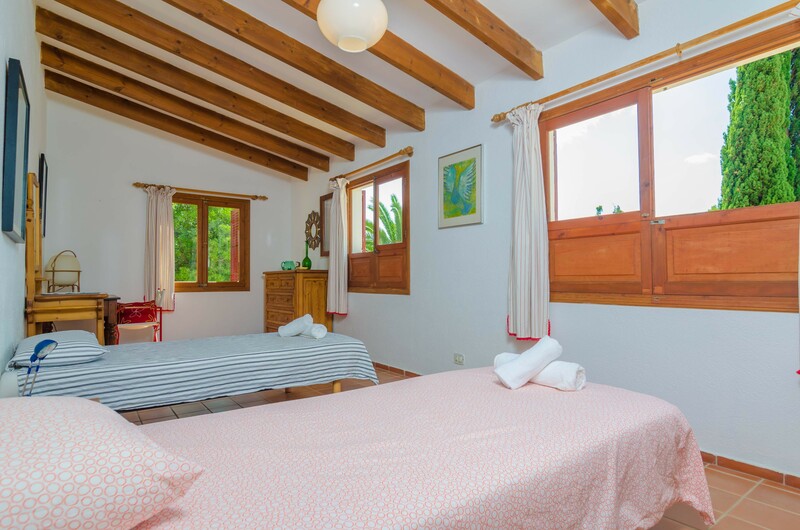 You will find several furnished areas by the pool to enjoy the good weather while having breakfast in the morning or dinner under the straw roof surrounded by a beautiful vegetation, or prepare a delicious barbecue. 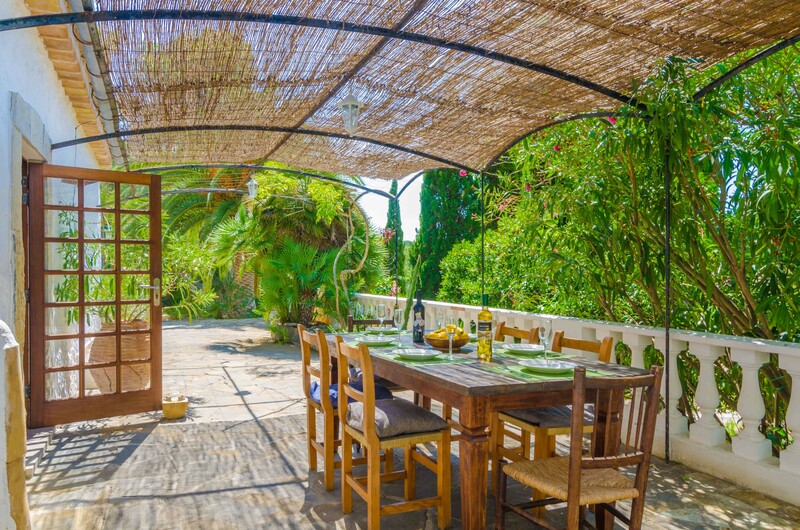 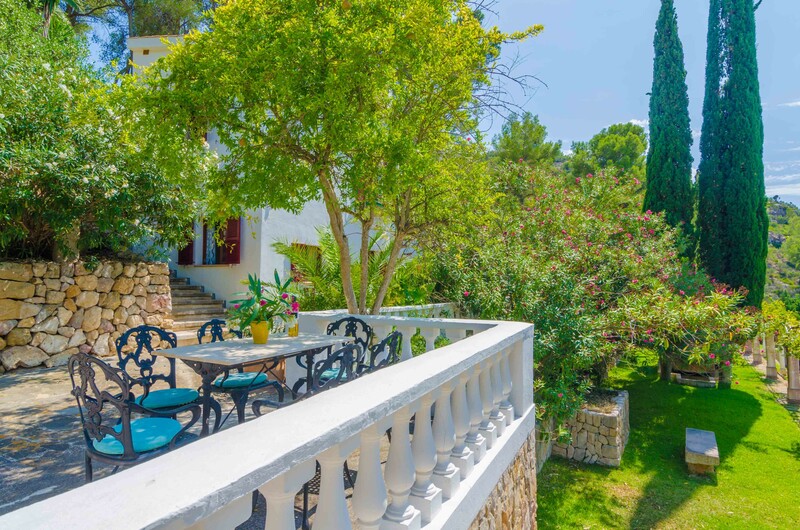 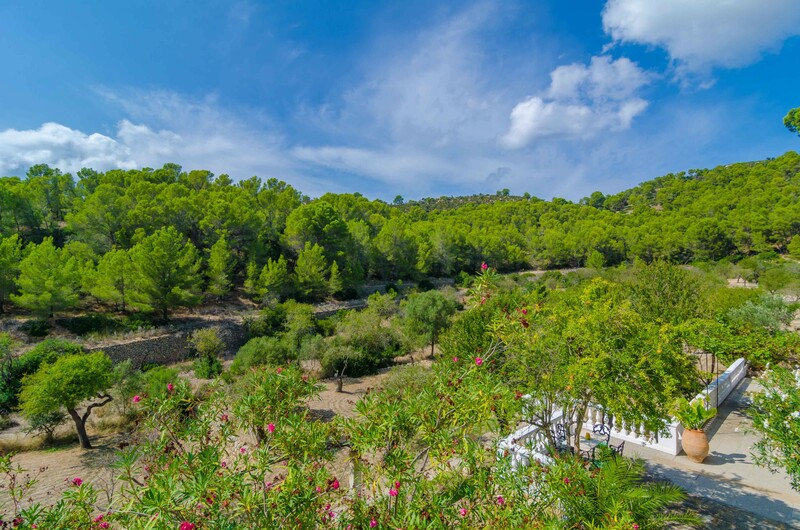 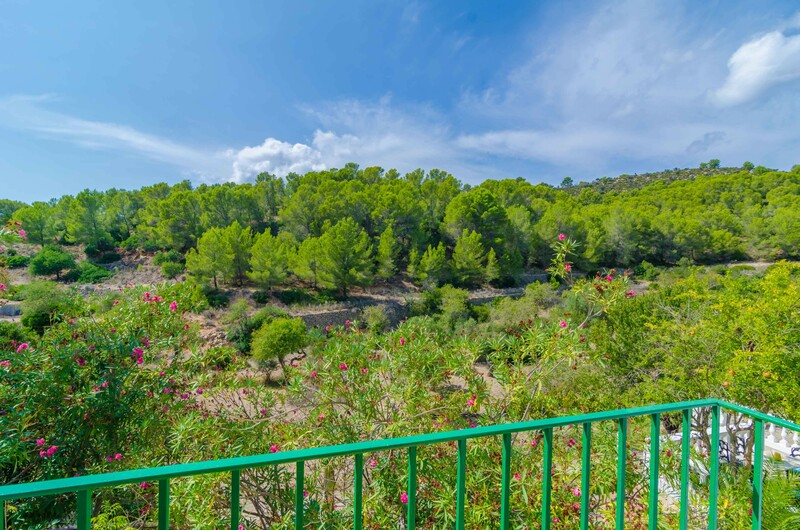 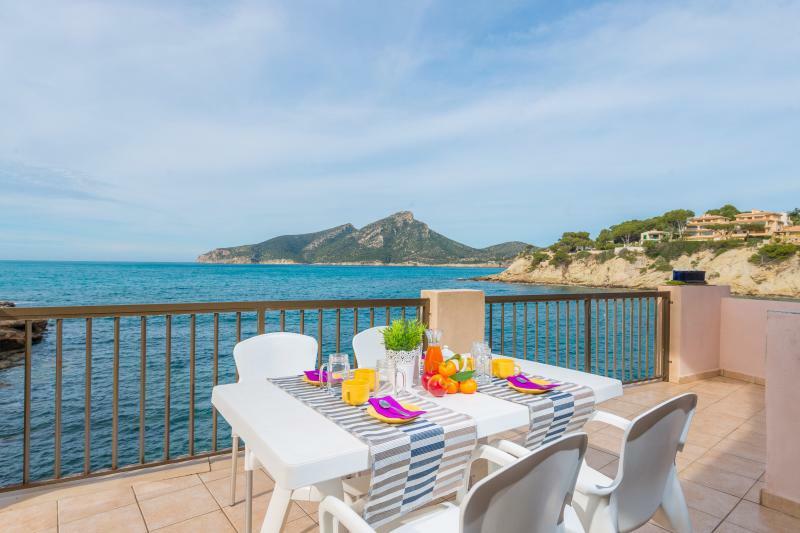 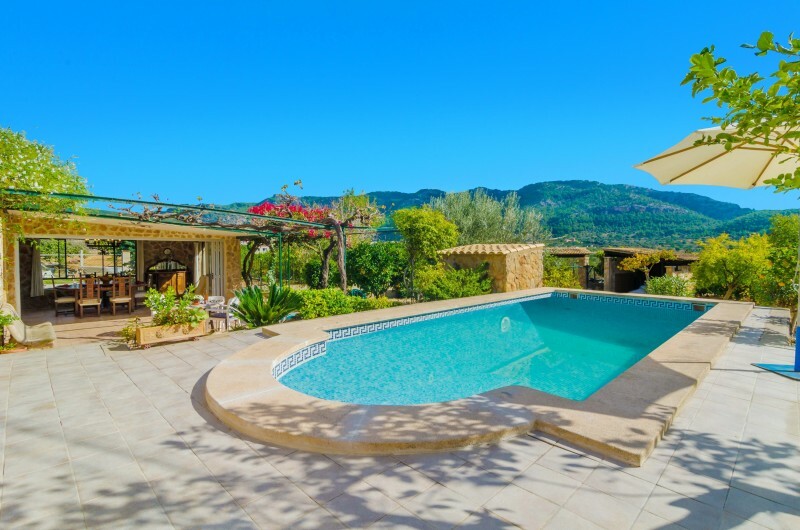 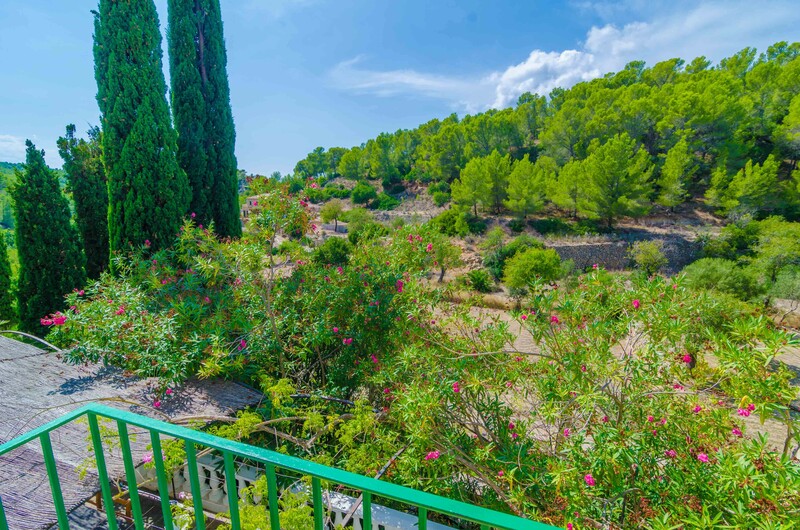 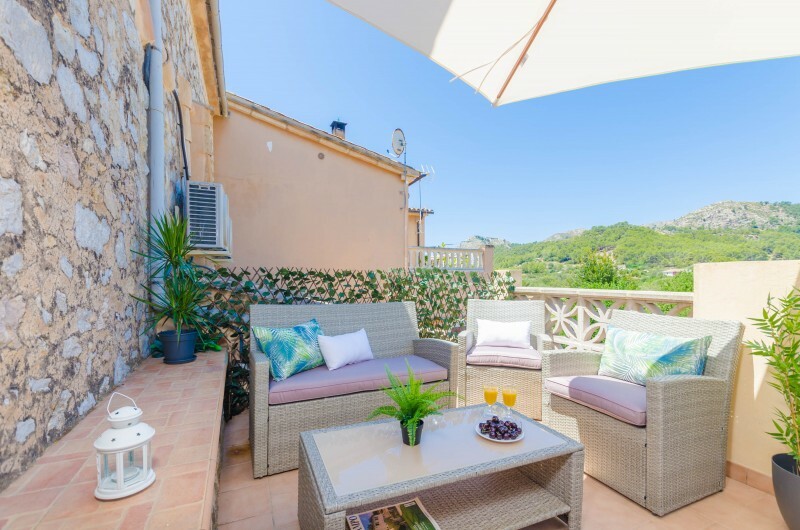 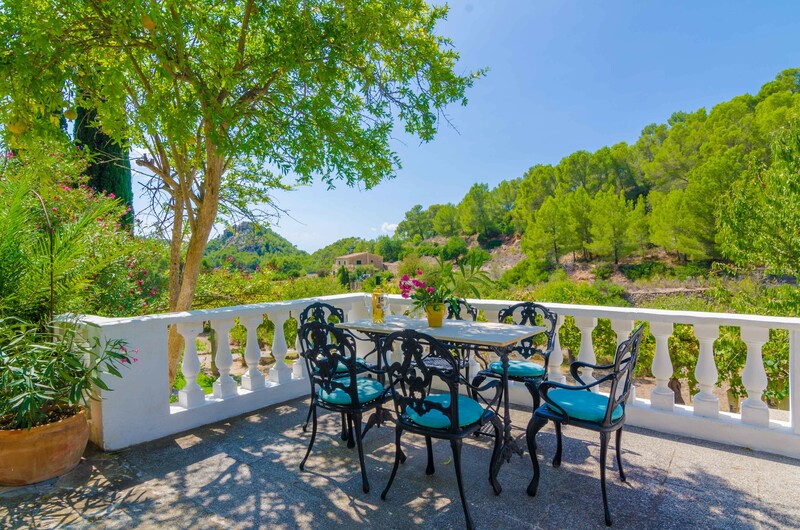 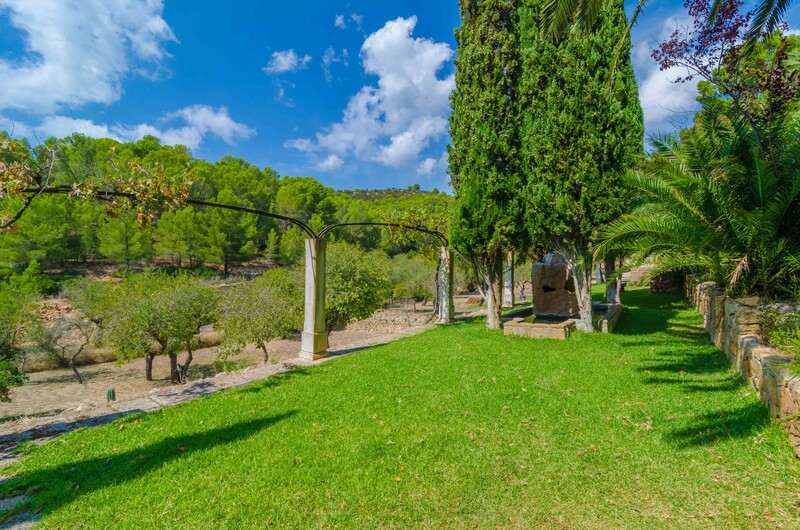 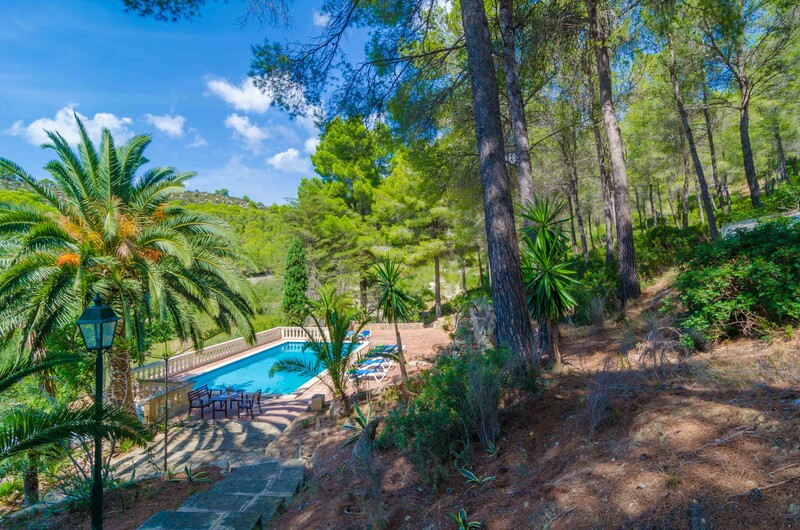 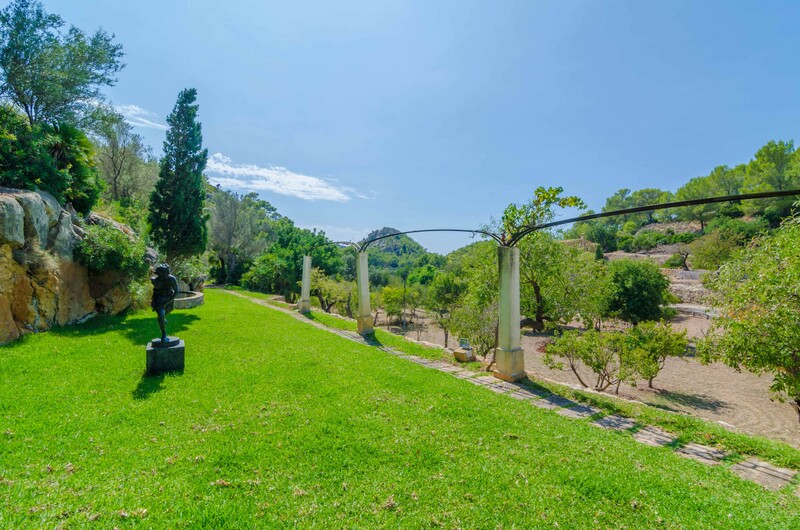 The house offers beautiful garden areas to enjoy the great Majorcan weather. 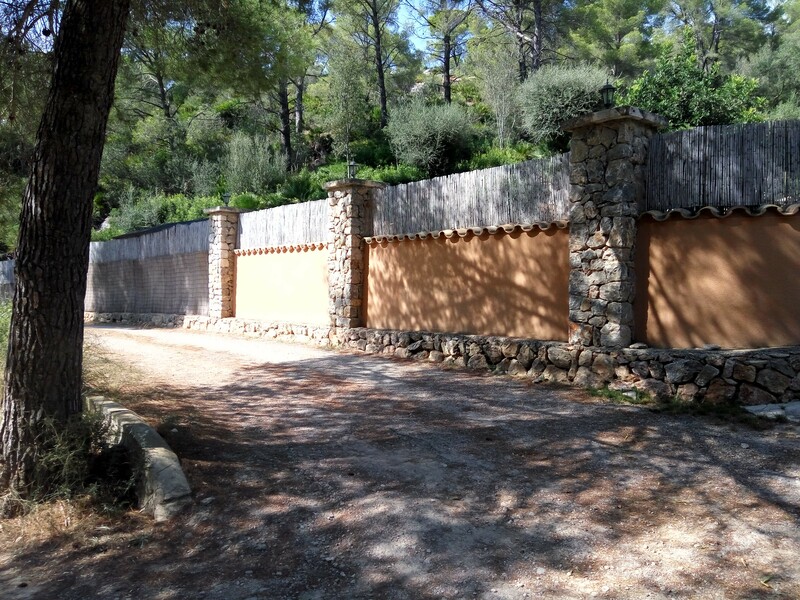 The property is fenced and there are neighbours around. 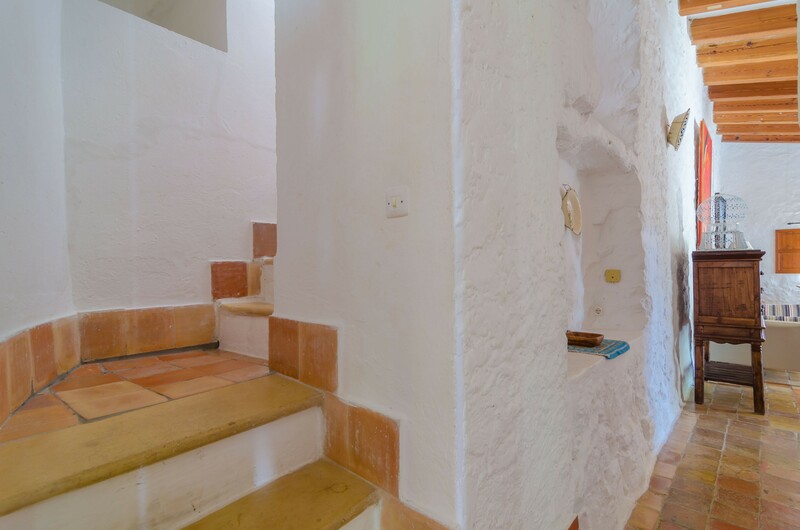 The 190 m2 house has 2 floors. 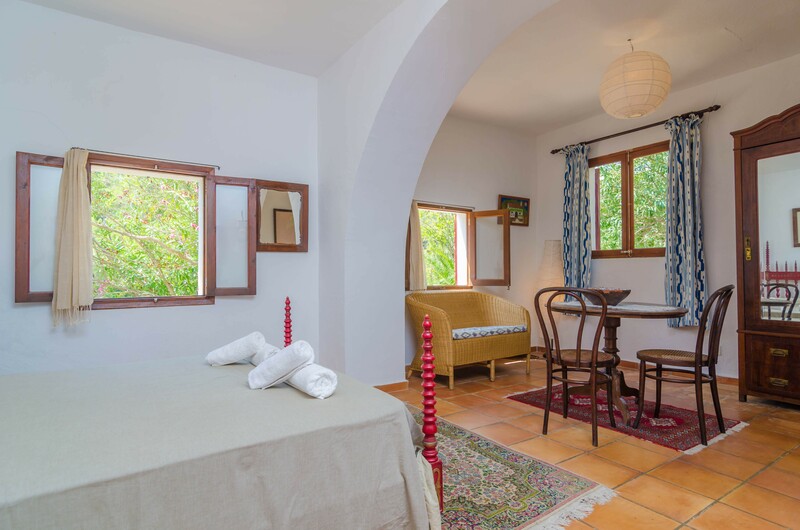 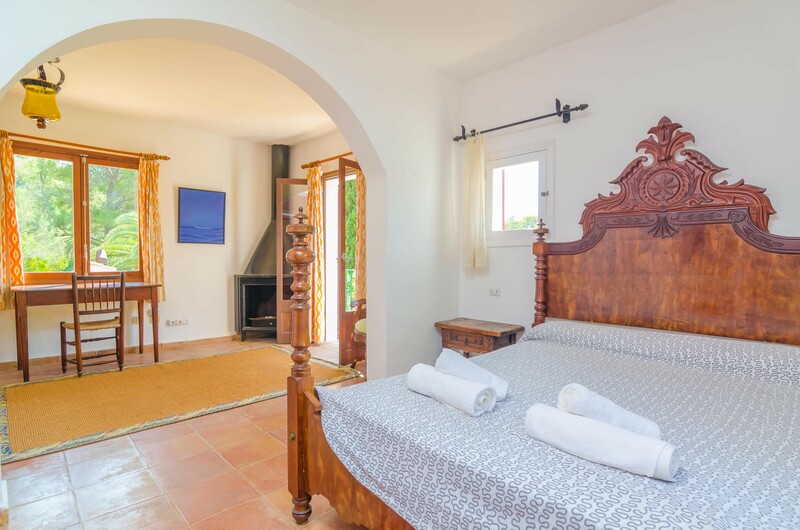 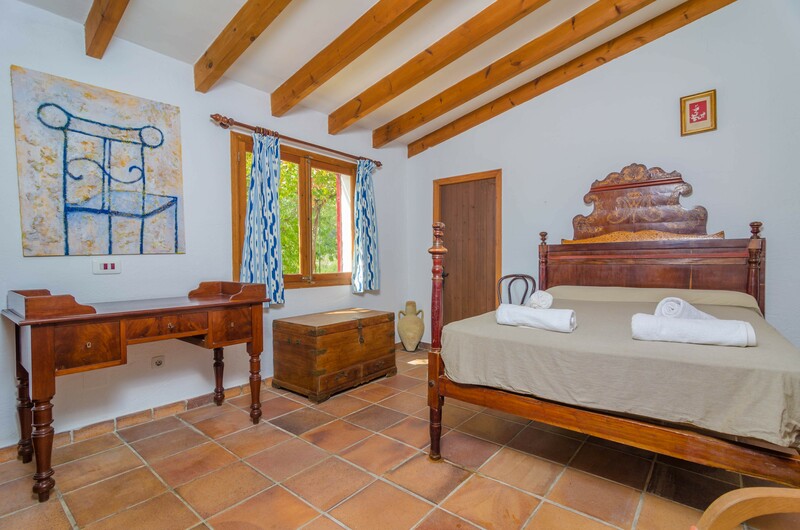 It has a unique style conserving traditional details like the wooden beams or the stoned walls, combined at the same time with nowadays elements so that you will have all comforts during your stay. 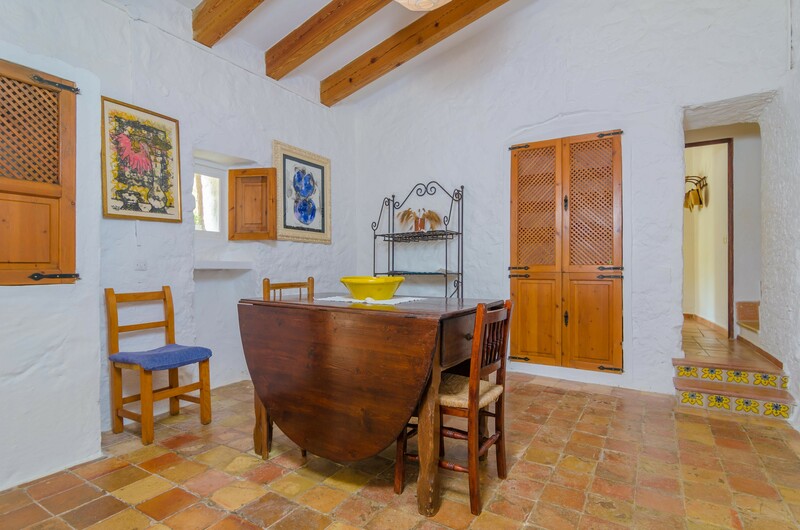 When entering you will find a spacious living- dining room with a sofa and armchairs where you can relax while watching TV and the rustic dining table. 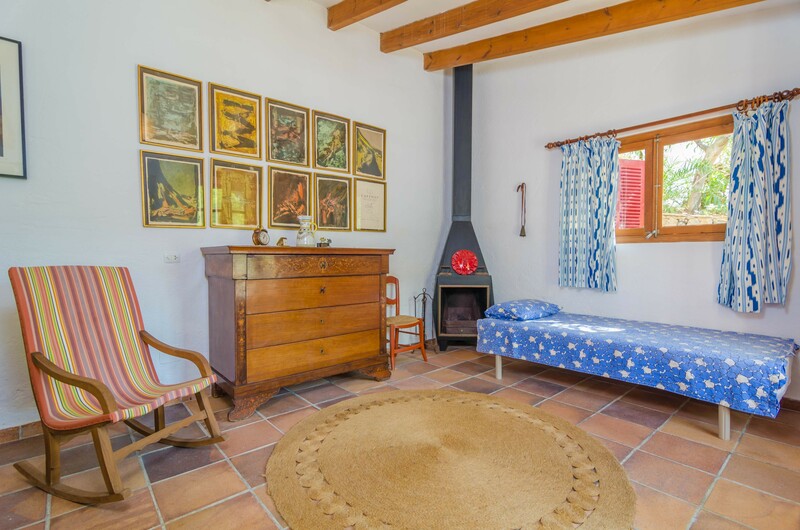 It also features a fireplace for the coldest days. 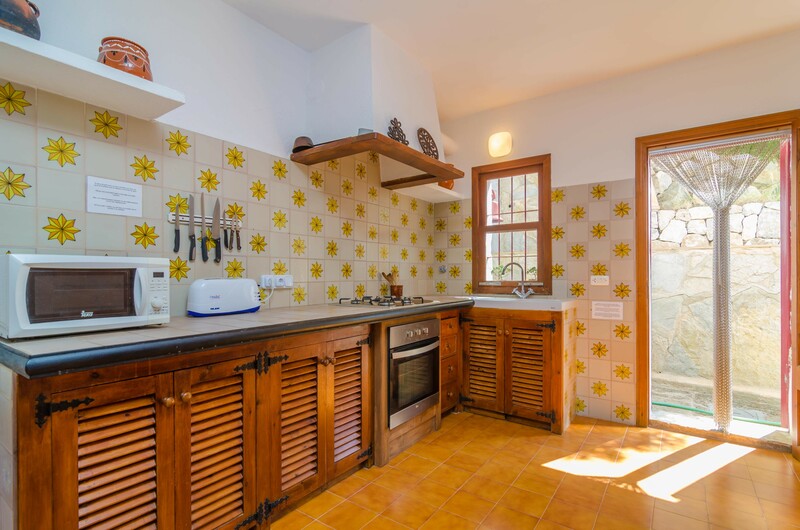 The kitchen is independent and it is well equipped to cook during your vacation. 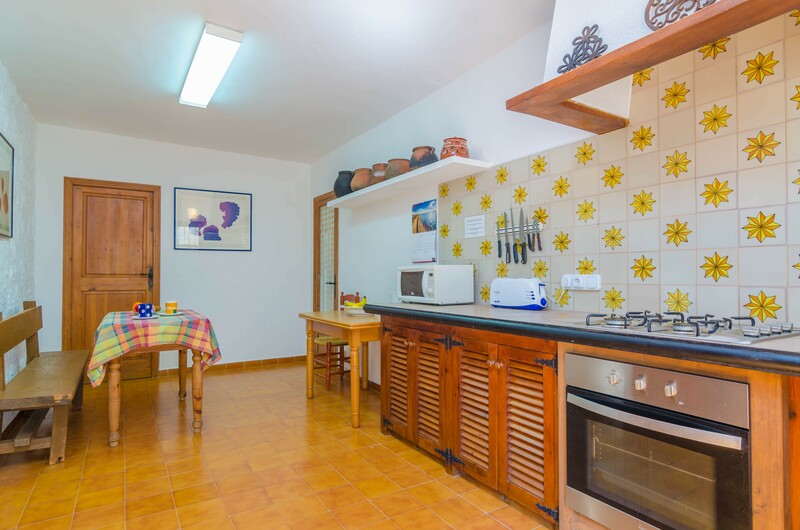 It offers a gas stove, a microwave, an electric oven and a table with chairs to cook in good company., among others. 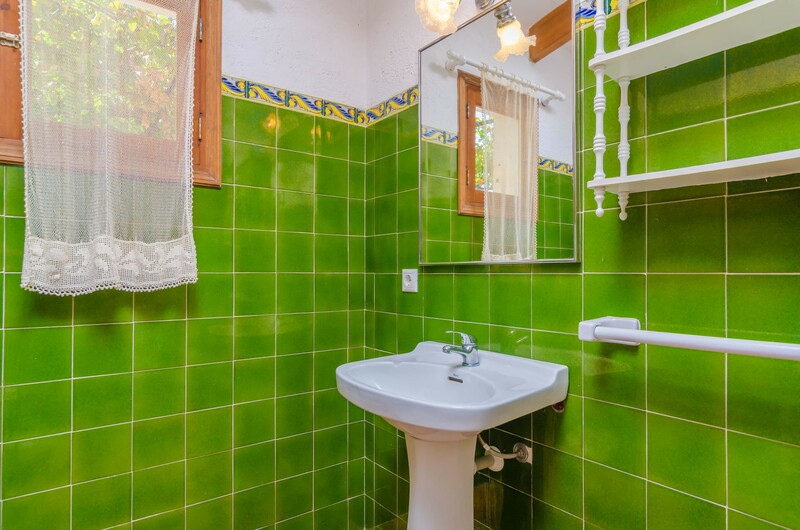 You will also find a washing machine, an iron and an ironing board. 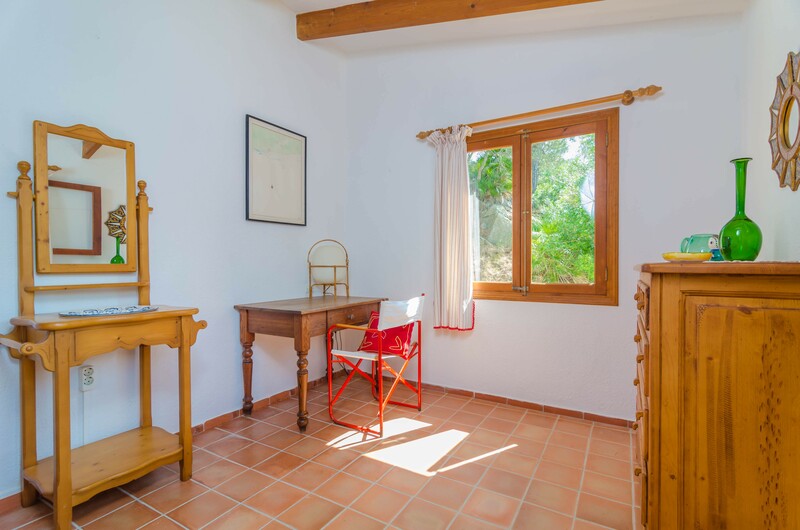 A bedroom with a double bed and wardrobe completes this floor. 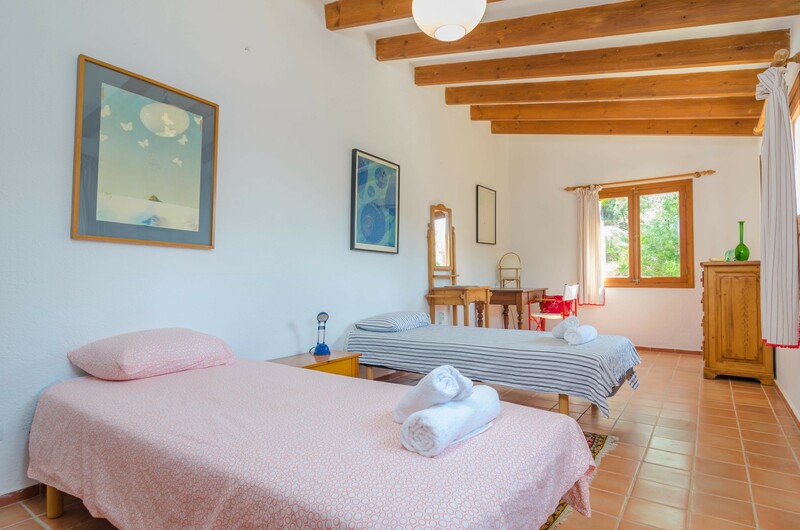 Upstairs there are two more bedrooms, one with two single beds and a closet and the second with a double bed, closet and a shower en-suite bathroom. 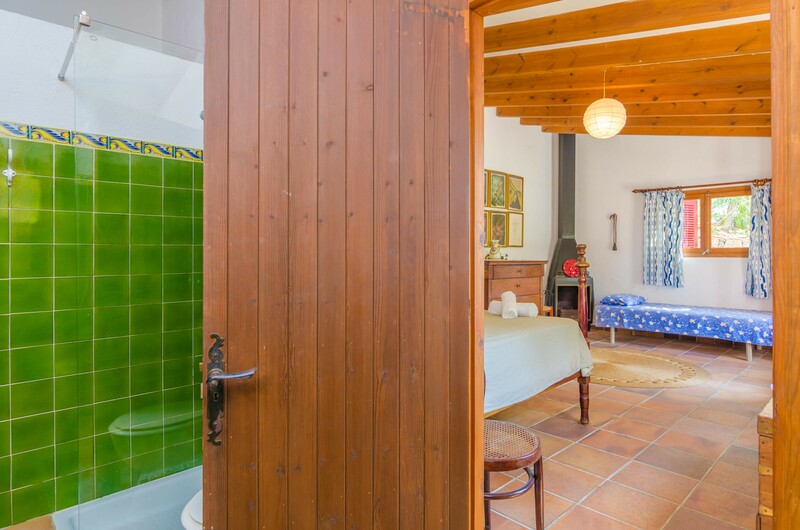 The last bedroom is outside the house. 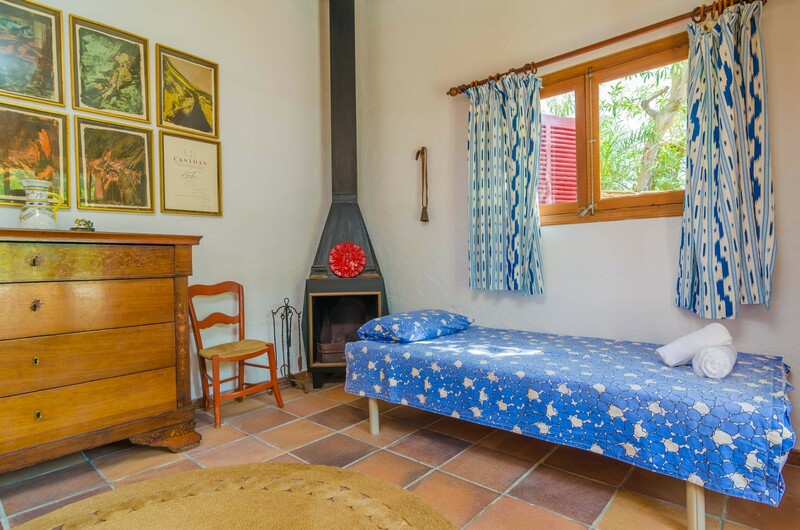 It is an annex with a double bed, a single bed, a closet and a fireplace for the coldest nights. 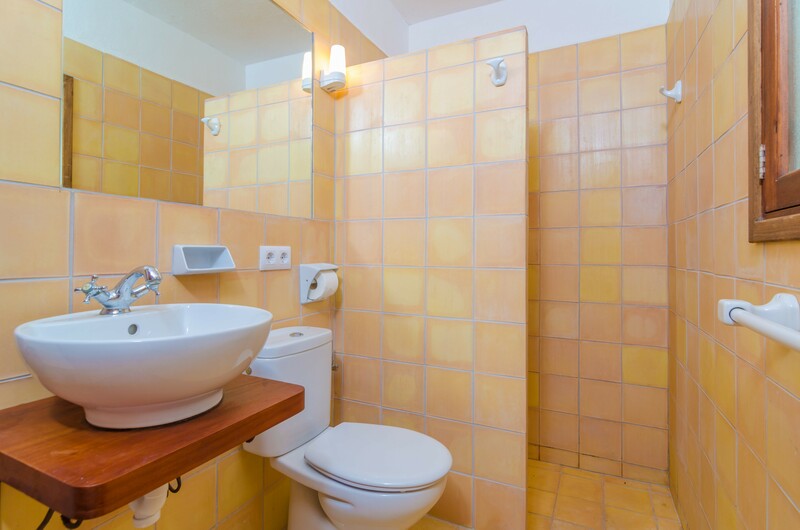 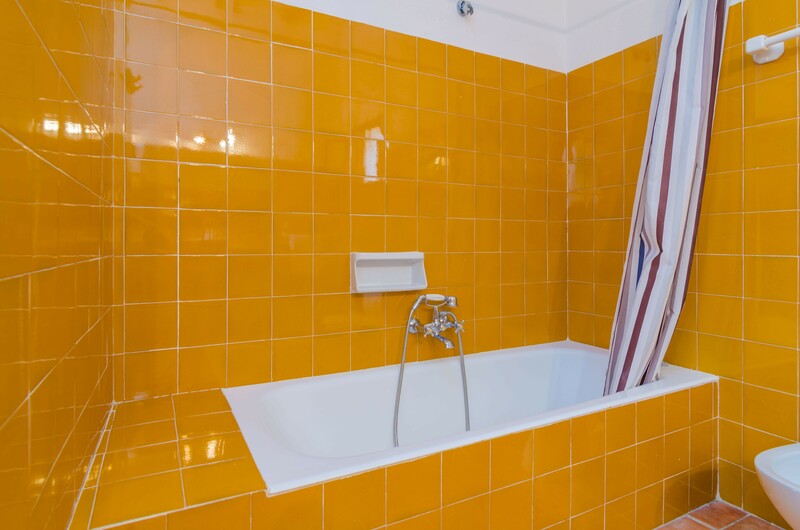 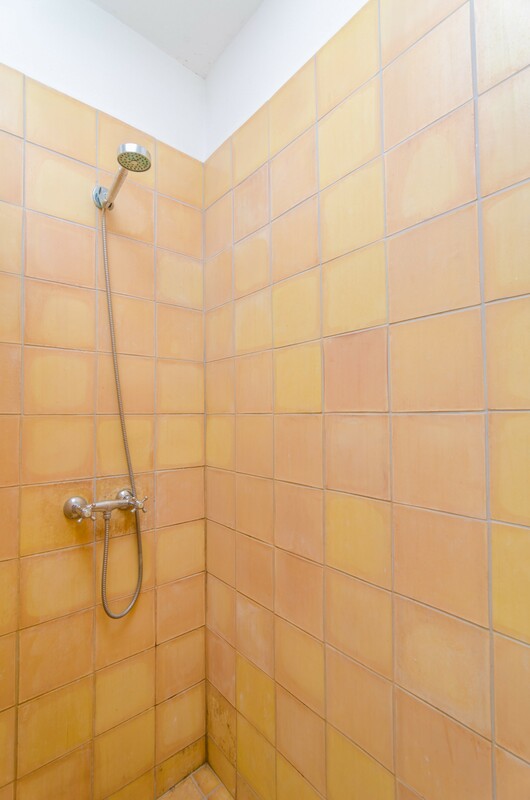 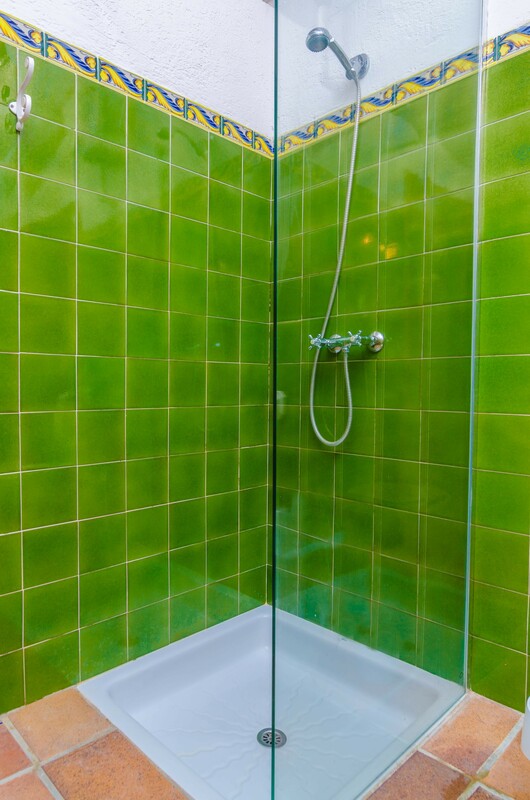 It also has a shower en-suite bathroom. 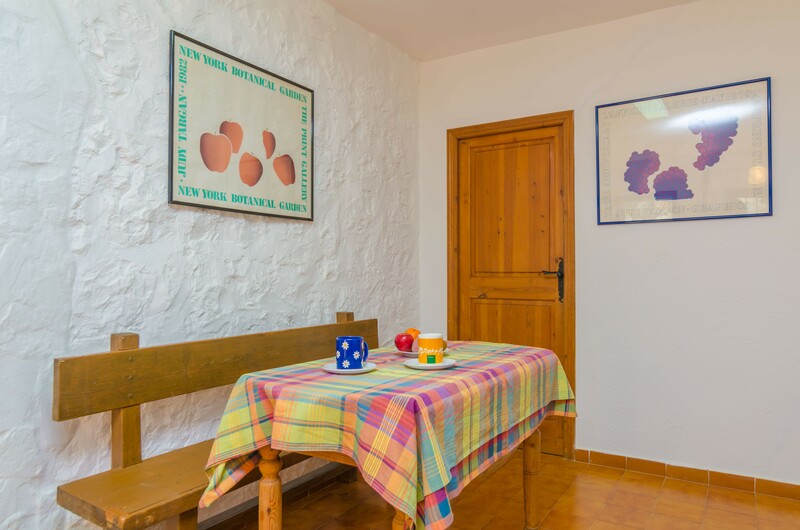 We can prepare a cot and a high chair if you are coming with your baby. 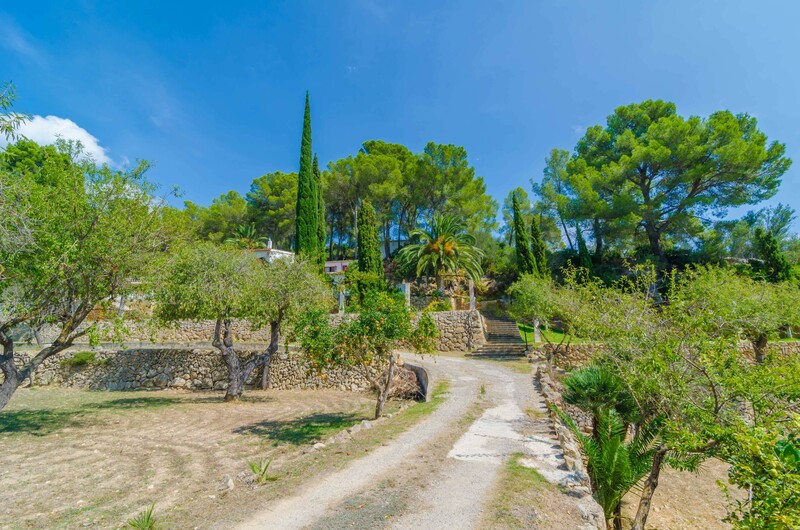 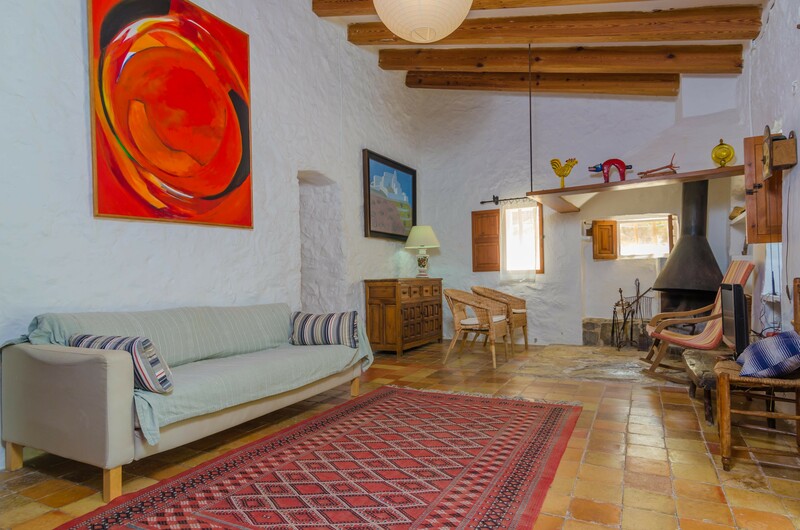 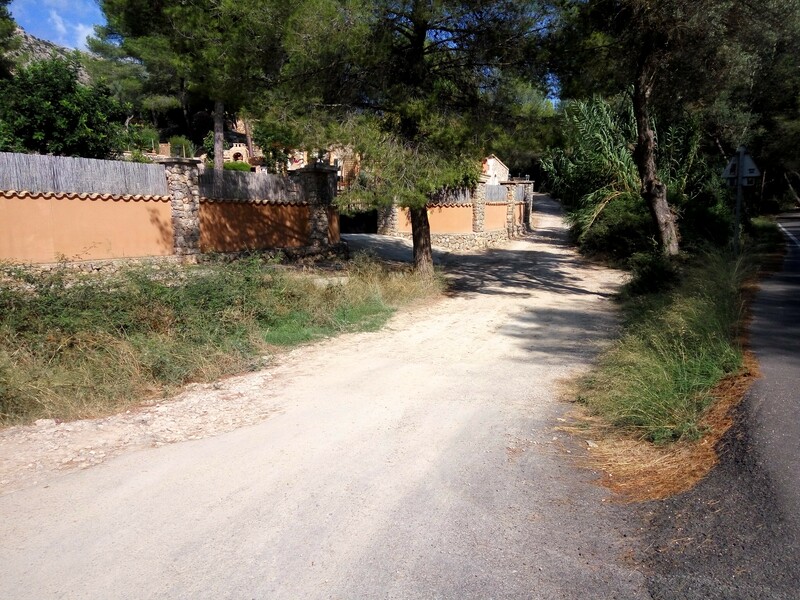 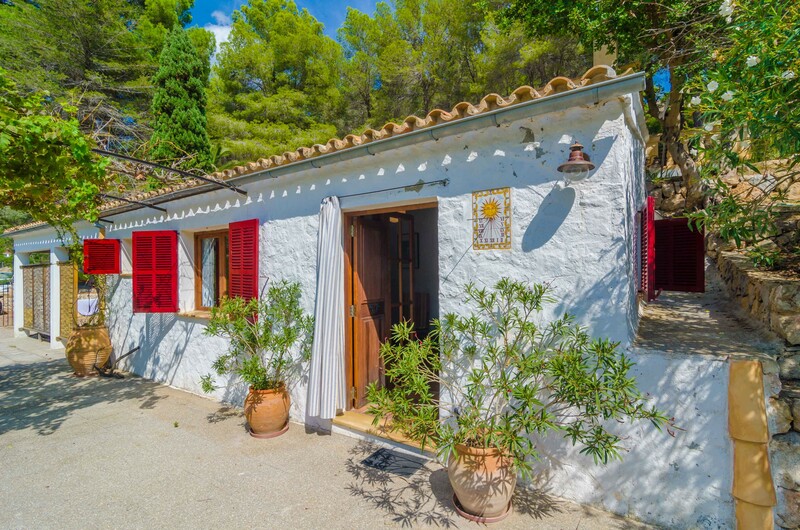 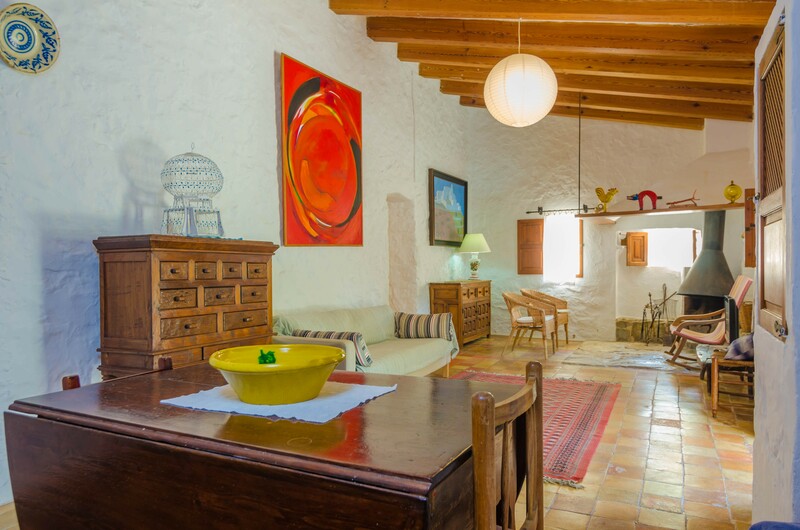 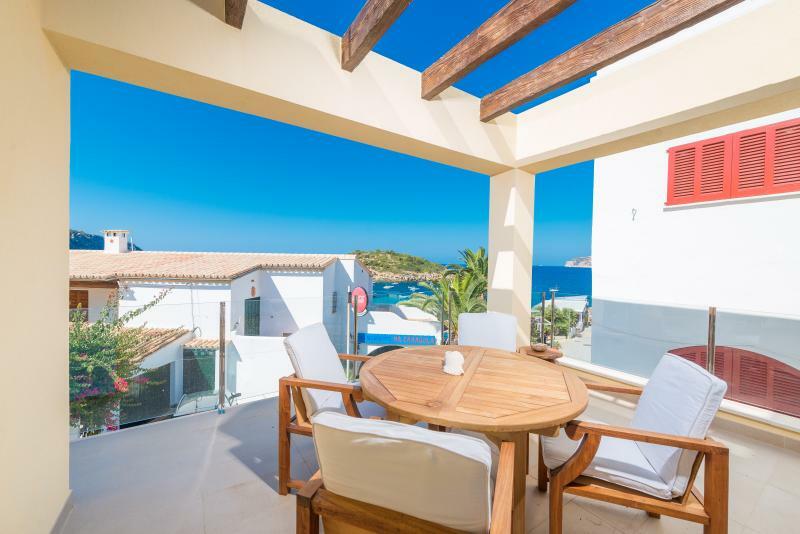 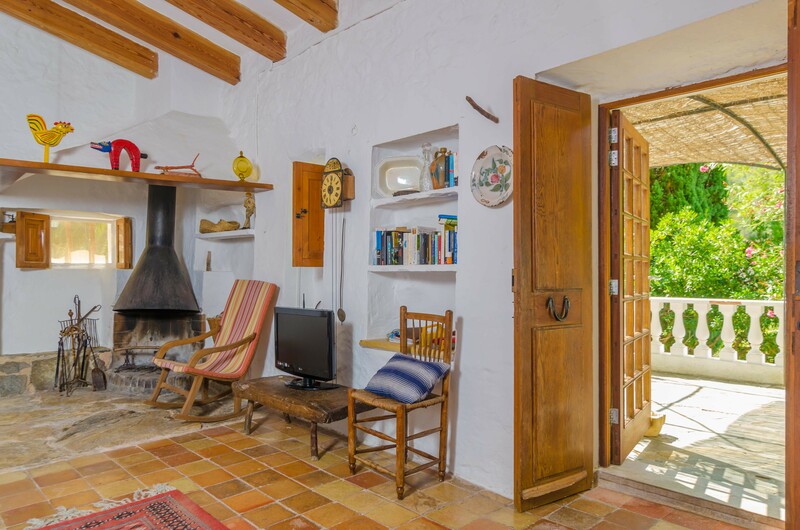 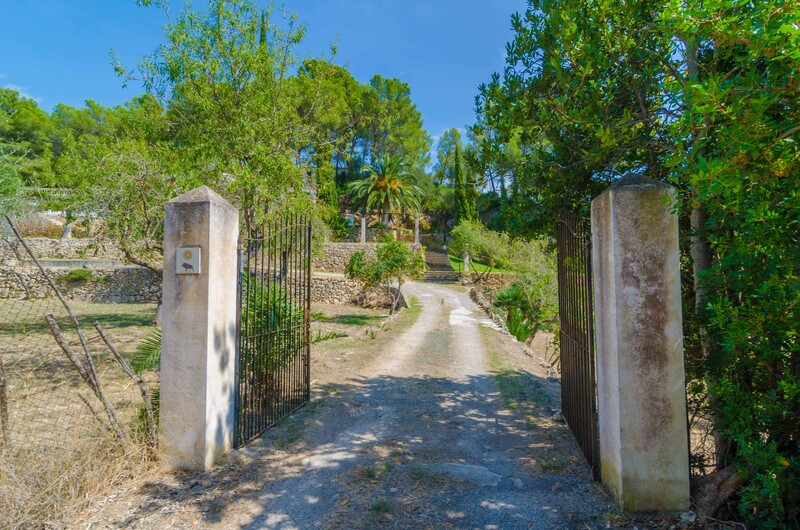 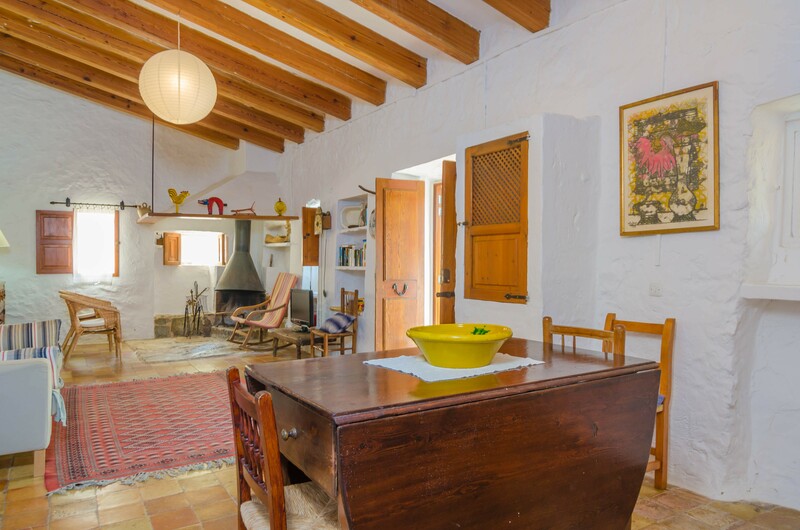 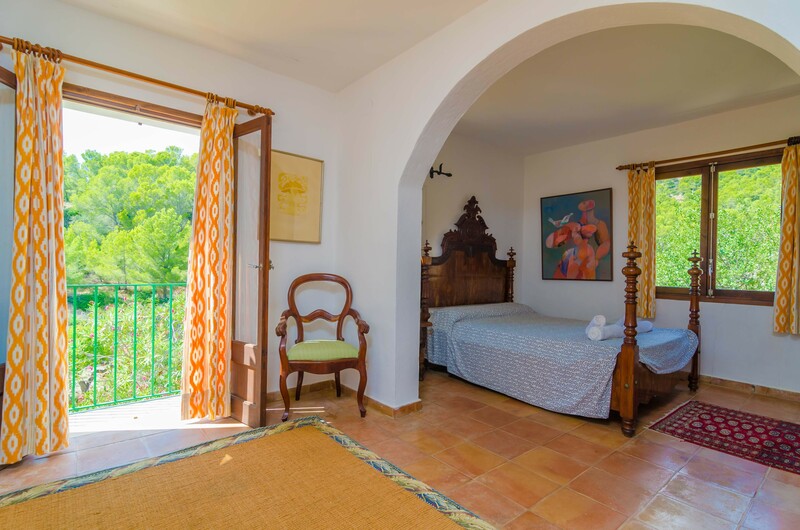 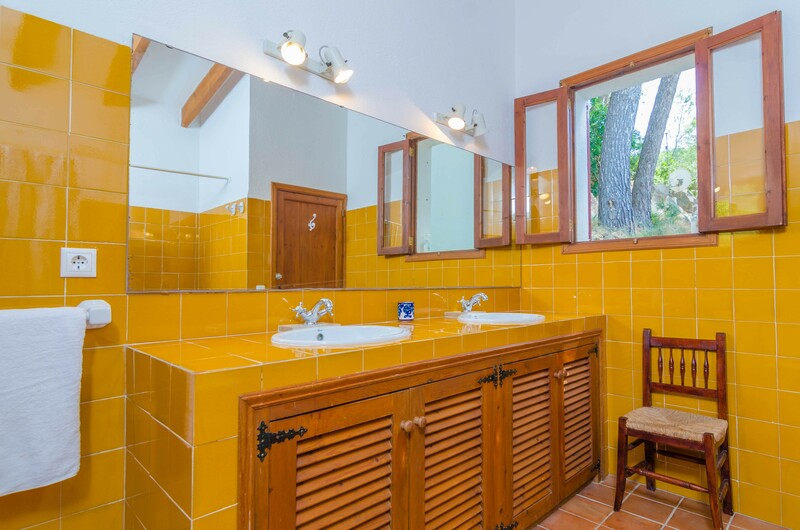 This house is only 1.5 km from the village of Sant Elm, a very quiet tourist area. 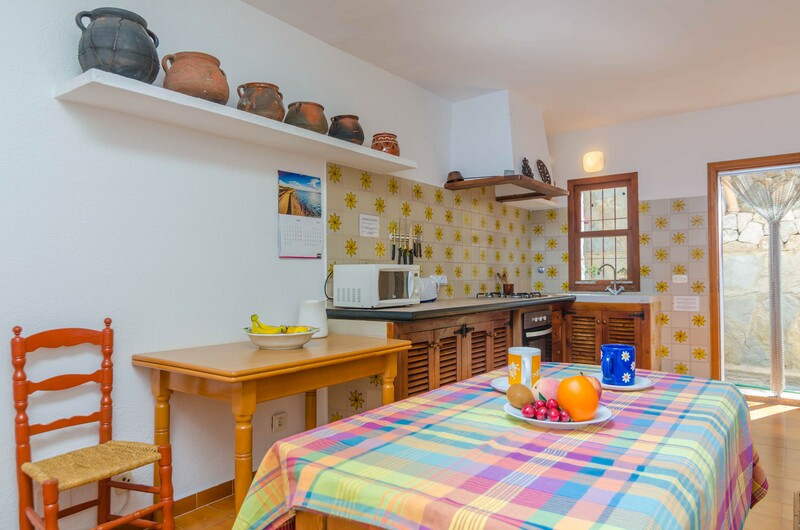 You will find the basic services in the village. 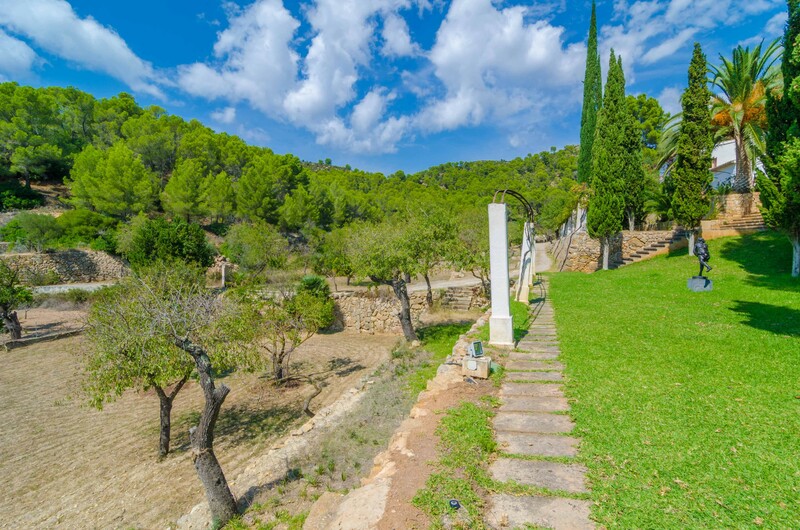 You can go to Andratx and Port d'Andratx for the rest, where you can have a walk and enjoy the gastronomy. 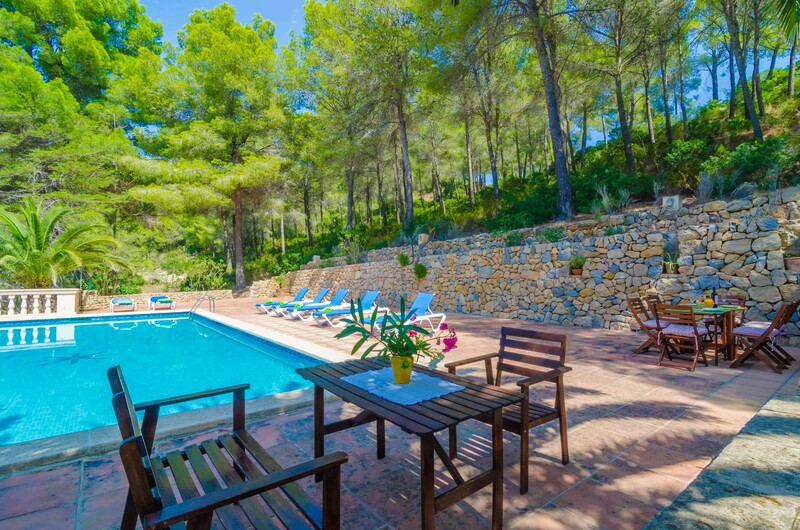 The beach of Sant Elm is only 1.5 km from the house. 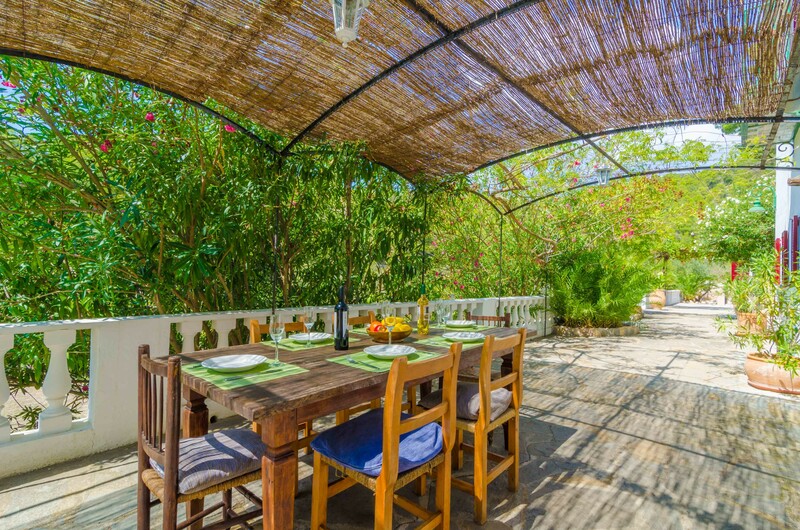 It is a little sandy beach where you can enjoy a nice beach day. 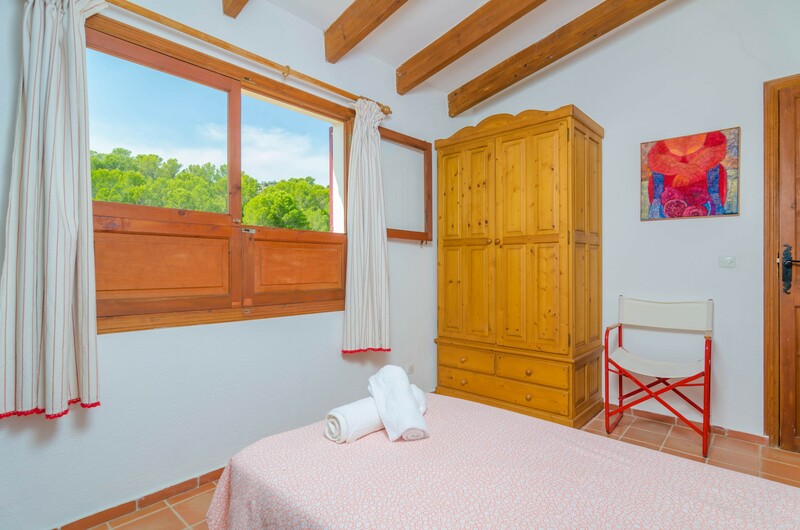 You can also visit Cala Conills, a rocky beach and a beautiful corner to relax in front of the sea. 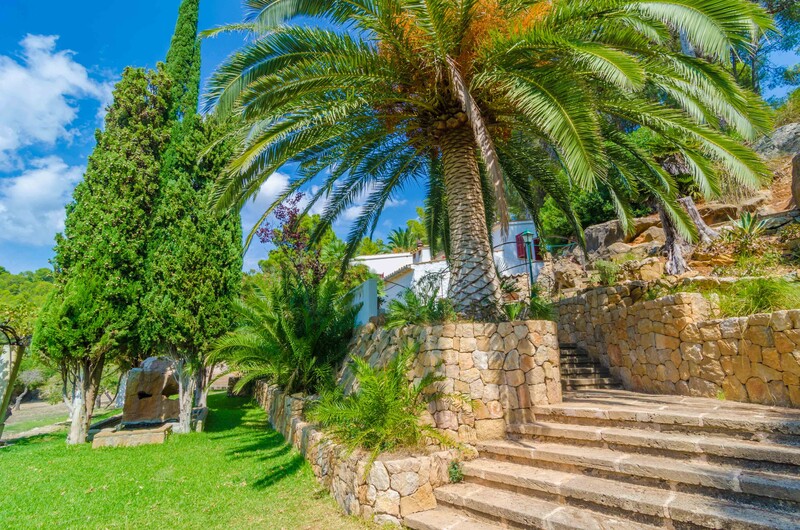 An excursion to the island of Sa Dragonera is a must visit. 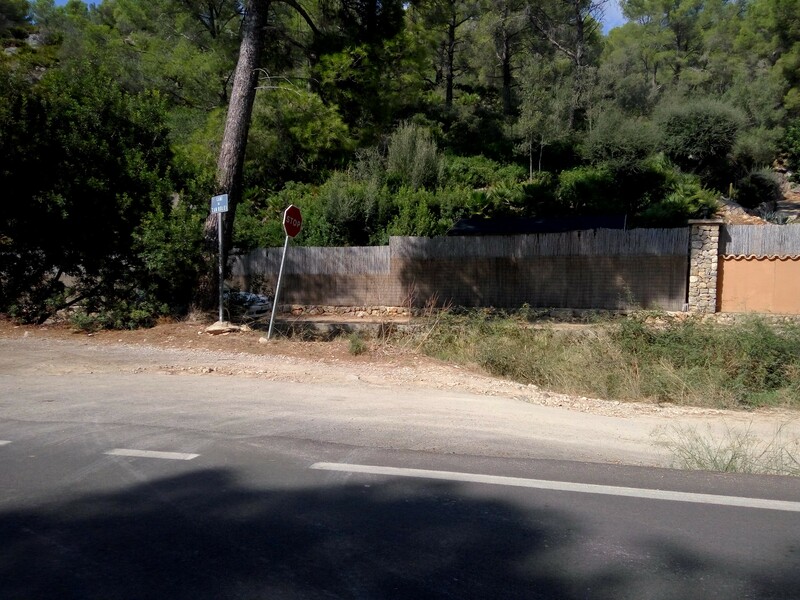 Since this is a forest area, it is forbidden to light a fire from June 1st to October 15th. 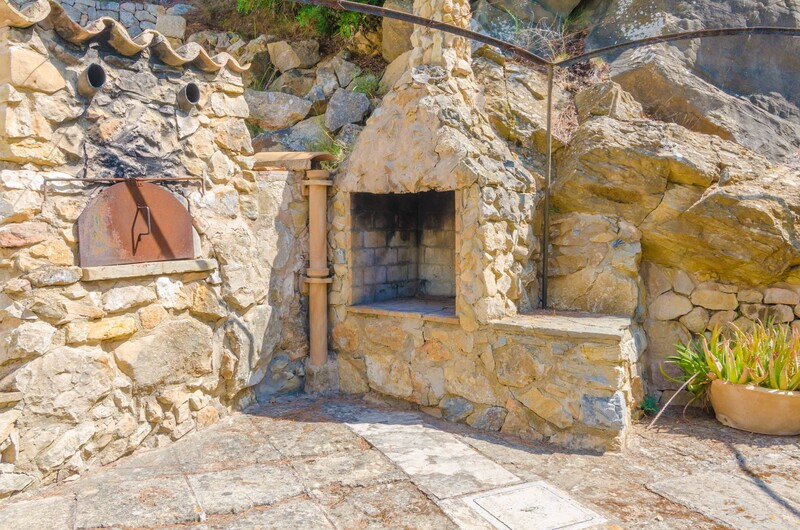 Therefore, the barbecue and the wood oven outside cannot be used between these two dates.